ColorWave Lobster Rope Doormat featured in Vogue.com - The New England Trading Company, Ltd.
Our special thanks to Vogue.com for featuring the our ColorWave Nautical Rope Doormat as one of the "10 Chic Doormats to Buy Before the Next Big Snowstorm"! Perfect for the snowy winter, these hard-working mats are also great for mud, sand, and water. 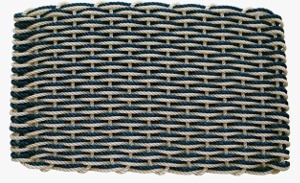 Each is handwoven from nautical rope made in Maine that fishermen use to tether lobster traps. Able to withstand the cold, harsh Atlantic, the rope is mildew, mold, and water-resistant. Say "goodbye" to the damp and stinky mats that hold in all the water - these welcome mats stay dry and are odor-free. Completely reversible, too.